Detroit, Michigan - A van from the Chariot commuter shuttle service on display at the Detroit Moves Mobility Festival. Chariot is owned by Ford Motor Co. 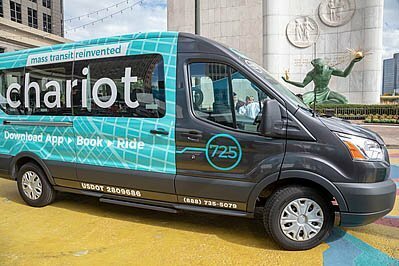 Image Description: Detroit, Michigan - A van from the Chariot commuter shuttle service on display at the Detroit Moves Mobility Festival. Chariot is owned by Ford Motor Co.